But before you write me off as crazy, just hear me out. Yes, it’s sweet . . . but so is balsamic, or caramelized onion, or yams – and each of these steals the show in many a savory dish. So although this plate is playing on the sweet side, it is decidedly UN-dessert-y. Trust me. In fact, it sort of tastes like a summer explosion. But for dinner. In a large pan, heat the oil over medium and add the diced onion. Sauté until glassy, a few minutes, and then add the garlic. Sauté a minute or so more, being careful not to burn the garlic. 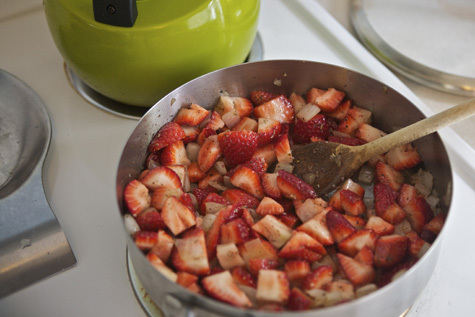 Add the strawberries and spices, stirring to keep from sticking (add more oil if needed). 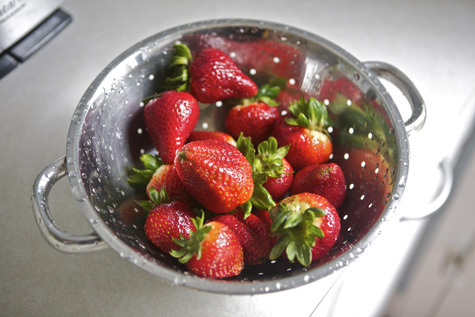 Strawberries will begin to darken and soften. Pour in the cooking wine to deglaze, stir well, then reduce heat and let simmer for a good 10-15 minutes. Stir in the balsamic just before serving. 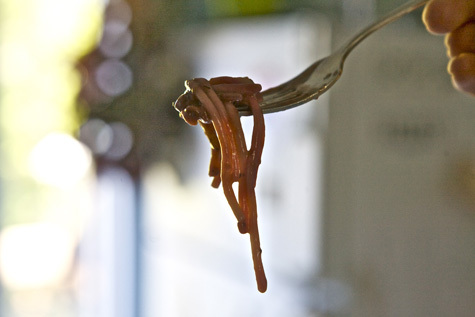 I spooned the sauce over the pasta, but you can toss it all together for awesome pink-hued noodley goodness. A special thanks to my pal Jeremy, who tweeted me an entire art history lesson whilst I wrote this recipe up, and to Waits, who kept me warm all snuggled up and snoring on my chest while it rained and thundered outside. Much love. Your recipe is better than my art history lesson. It looks so freakin’ yumskies. What a fresh take on marinara! I like the sound of this sweet-and-savory creation. Thanks for sharing. looks delicious! i am so excited to try it! Yum… Such a crazy idea! 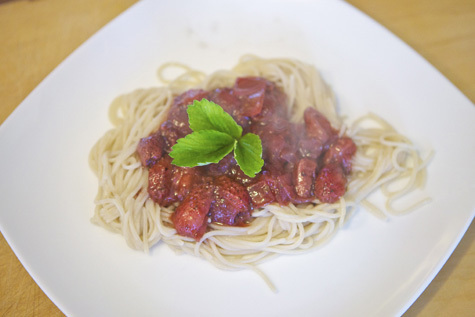 Strawberries and pasta :) The recipe looks really easy! Will try! How much do you buy organic anyway? I trust you that this is delicious, but I am scared of it and I don’t understand it. It’s like my constantly pre-menstrual older sister. I bid farewell Bonzai, enjoy your crazy strawberry madness! I bet this is delicious. I made a raw marinara with strawberries once, and it’s really not as sweet as you would have imagined. Yay! I’m so glad this went over well (of course I expect no less from such an openminded crew). If any of you do try it, please let me know how you like it! 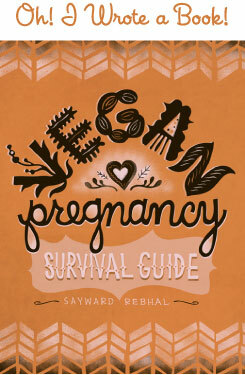 @ Minna – I’d say I buy 90-95% organic (not including eating out which of course is less). If there’s a choice I ALWAYS choose organic and where I live there’s almost always that option. The places I let it slide are with stuff that just doesn’t have the option (ie tinned water chestnuts or something) and sometimes in a dollar bag if it’s just a great bargain (totally depends on the produce in question) But everything else – produce, grains, nuts, legumes, pastas, preserves, etc – is organic. @ Amycat – Haha, I understand. My husband was the same way . . . until he tried it! Yum! Although I am not one of them, there are plenty of people with TOMATO allergies (poor, poor folk!) so this would be a great way to have your pasta and eat it too! @ rebecca – That pesto sounds delicious, thanks! I love your site. I am intrigued by this recipe. It will be great to see the fams reaction to strawberries for dinner. Enjoying the posts. @ Rachel – Yay! That’s awesome, thanks for the feedback. @ saundra – Thanks for the feedback! Sorry your kids weren’t so into it, haha. At least you tried!